At number 10 in Rolling Stone Magazine’s list of the 100 greatest Beatles songs is “While My Guitar Gently Weeps”. This George Harrison song appears on the Beatles’ White Album, and is one of my favourite Harrison songs. It is sometimes referred to as Harrison’s first “great song”, although I would dispute this as I think he wrote some pretty great songs before this one. And, an acoustic version of “While My Guitar Gently Weeps”, which I like even more that the version on the White Album, appeared on the Beatles’ album Love, which was put together by George Martin and his son Giles for the Cirque du Soleil show in Las Vegas. Unusually for a Beatles’ song, it included another rock star on lead guitar, namely Eric Clapton, although he is not credited. By this time he and Harrison had become good friends, and Harrison invited Clapton to play on the recording. After initial reluctance – “Nobody ever plays on The Beatles’ records”, he agreed, and used Harrison’s Gibson Les Paul electric guitar. In addition to appearing 10th on the list of the 100 greatest Beatles songs, Rolling Stone Magazine have also ranked it the 7th in the list of the 100 greatest guitar songs of all time. Here is a video of this wonderful song, and it is the version which I prefer, the one in Cirque du Soleil’s Love. It also shows that particular part of the Cirque show. Enjoy! UPDATE: Unfortunately, to reduce my use of the allocated storage space for images, I have had to remove the gallery. This is what the gallery looked like. A screen capture of the gallery. I have had to remove the individual images to save space. Sorry! 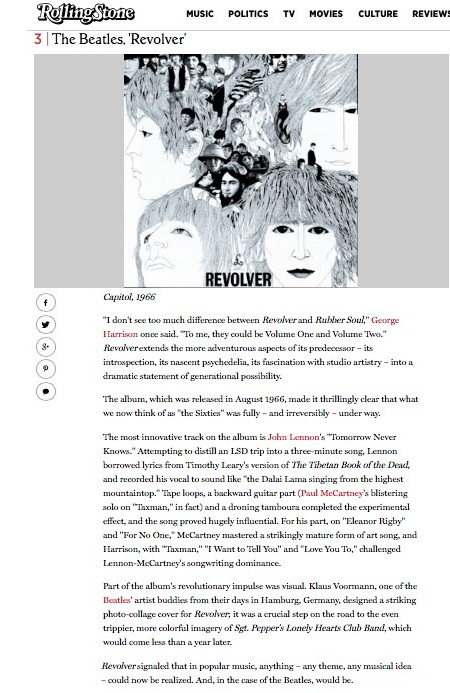 At number 3 in Rolling Stone Magazine’s list of the 500 greatest albums is “Revolver” by The Beatles. As I said in my blog about “Abbey Road”, the last album that The Beatles recorded, “Revolver” is my favourite Beatles’ album. To me, this album is simply perfection, there is not a weak song on it. Even the McCartney songs are amongst his best, with songs like the groovy “Gotta Get You Into My Life”, the sublime “Eleanor Rigby” and the beautiful “Here, There and Everywhere”. This is McCartney at the top of his game. At number 3 in Rolling Stone Magazine’s list of the 500 greatest albums is “Revolver” by The Beatles. There are three songs by George Harrison on “Revolver”, the first of which, “Taxman” opens the album, something Harrison had not been granted before. One of his other songs on this album is the Indian-music infused “Love You Too”, which is my favourite Indian-influenced song by him. Of the 14 tracks on the album, three were written and sung by Harrison, one Lennon & McCartney song is sung by Ringo – the kids’ favourite “Yellow Submarine” (the first Beatles song I ever remember hearing), 5 songs have McCartney on lead vocal, and 5 have Lennon on lead vocal. 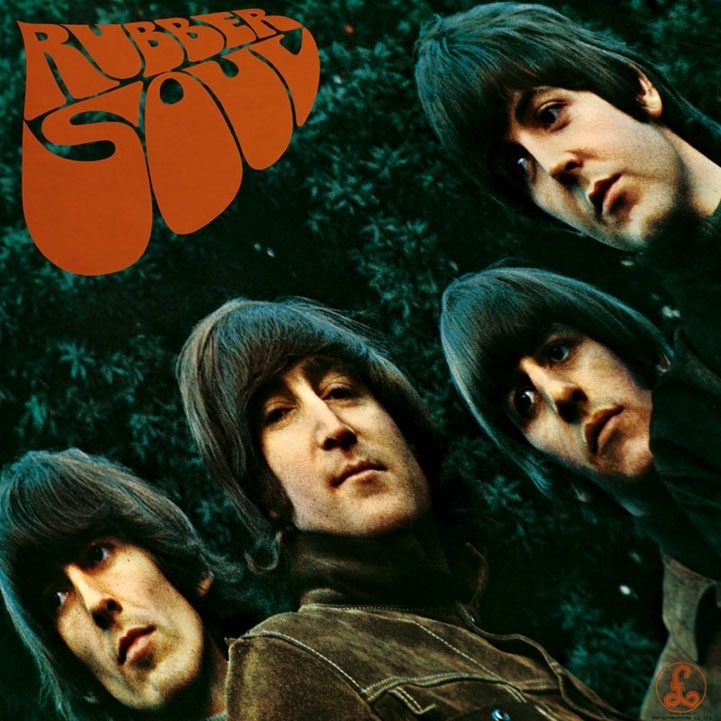 Unlike its predecessor, “Rubber Soul”, there is much less two or three-part harmonies on “Revolver”, an indication that the band were going more and more their separate ways. My favourite songs on this album are the Lennon songs. In particular the incredible “Tomorrow Never Knows”, the Beatles’ first foray into psychedelic music. It is a mesmerising song with surreal lyrics and a complex soundscape which involved hours and hours of work in the studio by the band and their producer George Martin. “I’m Only Sleeping” speaks of Lennon’s insomnia, and “She Said She Said” came from a phrase that actor Peter Fonda apparently kept whispering in his ear at a party – “I know what it’s like to be dead”. For me, albums don’t get any better than this one. This is the best that there is, bar none! I thought I would share the opening track with you, George Harrison’s “Taxman”, his swipe at Government taking 95% (yes, ninety five percent) of their income in the mid 1960s. The “Mr. Wilson” and “Mr. Heath” in the lyrics below refer to Harold Wilson, the then British Prime Minister, and Edward Heath, who was leader of the opposition Conservative party at this time. Here is a YouTube video of the song. Enjoy! 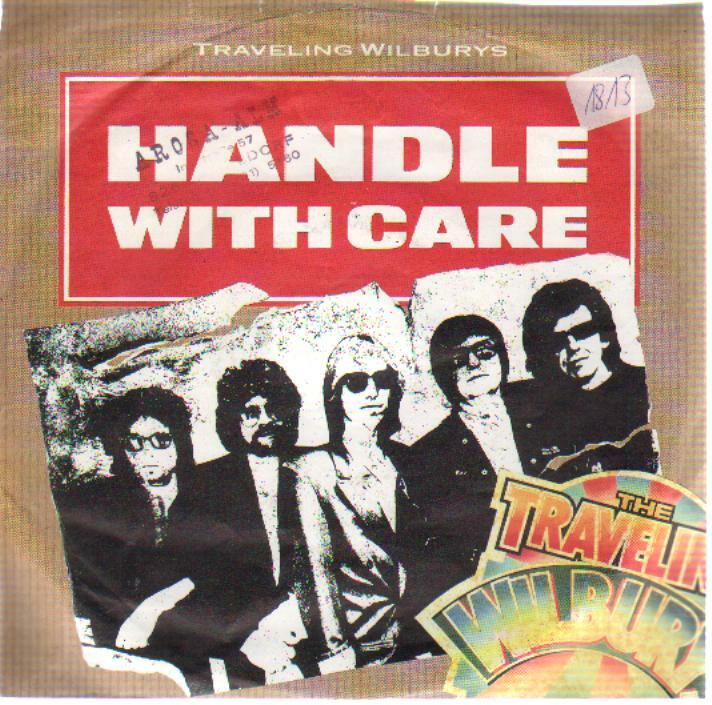 Today I thought I would share this great song by The Traveling Wilburys – “Handle With Care”. The Traveling Wilburys were a “supergroup” formed by George Harrison in the late 1980s, and comprising himself, Bob Dylan, Tom Petty, Roy Orbison and Jeff Lynne. They released two albums (confusingly known as “The Traveling Wilburys Vol. 1” and “The Traveling Wilburys Vol. 3”), but sadly Roy Orbison died between the the two albums, so only features on the first album. The writing credits for this song are shared by all five members of the band, although it was George Harrison who had the original idea for the song. Other band members contributed various lines to the song which was composed in the recording studio, so hence the credit going to all five members. “Handle With Care” reached number 21 in the Disunited Kingdom singles charts, and number 45 in the USA. Here is the official video of this great song. Enjoy! Which is your favourite Traveling Wilburys song? Today, at 11:02 Universal Time, the Sun will cross the celestial equator moving from the South to the North. This is the vernal (spring) equinox, the first day of Spring in the Northern Hemisphere. It is the most important date in the Astronomical calendar, and it used to be New Year’s Day in many civilisations. What better way to celebrate than with this beautiful song….